As of March 10th 2015, The Engagement Ads Certification Badge was renamed to Custom Lightbox Certification (Learn more). Studio Certified developers, do you want to tell the world that you can create innovative ads designed for users to connect with brands? With DoubleClick Studio's Engagement Ads Certification, you can get certified in building ads that marry the art of brand building with the science of performance display. Engagement Ads are tuned to user engagement – not clicks, letting brands connect with users through multiple creative formats. Ads are available on a cost-per-engagement (CPE) basis, allowing advertisers to bid and pay only for user engagement. 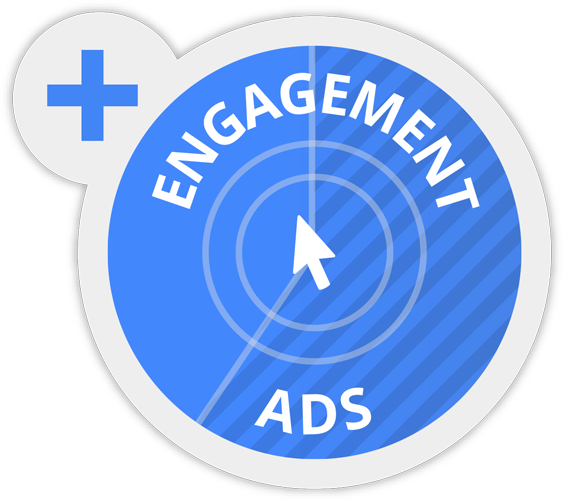 Engagement Ads fit in standard display units, allowing them to scale across the web and then expand to a larger format after an innovative two-second hover delay. This delay eliminates nearly all accidental expansions, providing a better user experience and more accurate reporting to advertisers. With this flexibility, the richness of a campaign using Engagement Ads depends on the story the brand wants to tell and the type of content they want to promote. Creatives can range from rich, interactive videos built in DoubleClick Studio to immersive brand experiences using HTML5, CSS3, and WebGL – all without leaving the ad format on the publisher's website. Check out an Engagement Ad format in action. You also receive the benefits of the Studio Certification Program, including exclusive access to betas and product features, DoubleClick hosted events and workshops, and a badge you can use for self-promotion. Pass the exam and get the badge to demonstrate your expertise in creating rich ads to boost user engagement. Take the Engagement Ads exam and get certified. Note: You must be Studio Certified in Core Flash or HTML5 to take the Engagement Ads certification exam. NOTE: As of March 10th 2015, The Engagement Ads Certification Badge was renamed to Custom Lightbox Certification (Learn more).